I have a habit of finishing my knitting projects just as the season was ending. 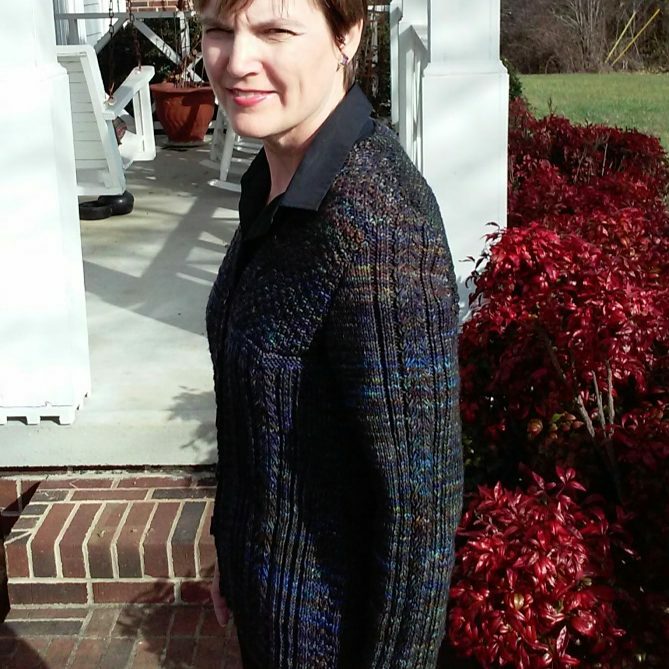 I was beginning to think we would run out of cold weather before I finished this sweater started in September. We are expecting very cold weather next week so it looks like I'll have lots of days to wear it. The colors were a challenge. It hand dyed Malabrigo Rios yarn in Candombe and was almost all the same dye lot. However, the spools were often very different. The back is mostly black but when I caught onto the color changes, I alternated spools so it blends reasonably well. 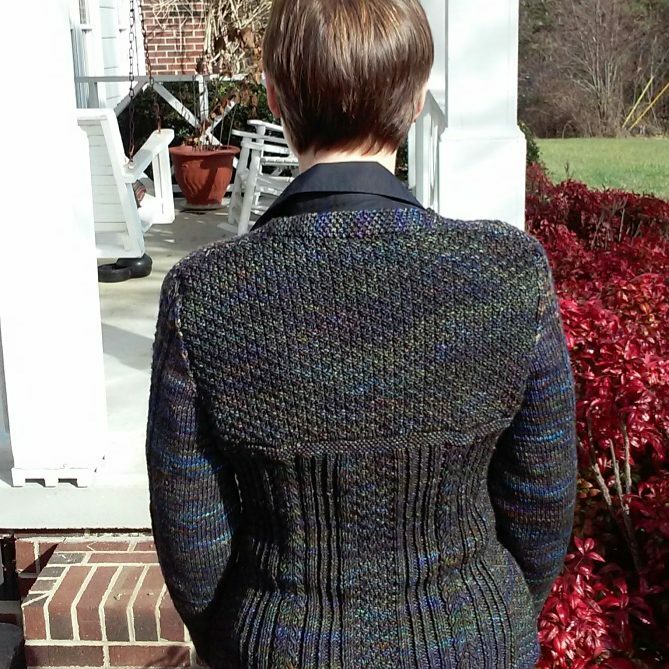 Still the back is mostly black and the sleeves mostly blue and green. 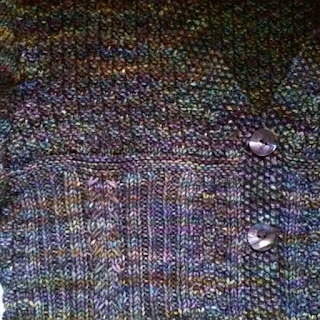 The front is mostly purple which goes with the purple buttons I got at the same yarn shop. I've loved working with this yarn and mostly loved going to my local knitting shop when I have a chance to knit amongst fellow crafters. The colors don't show up that well in the photos. 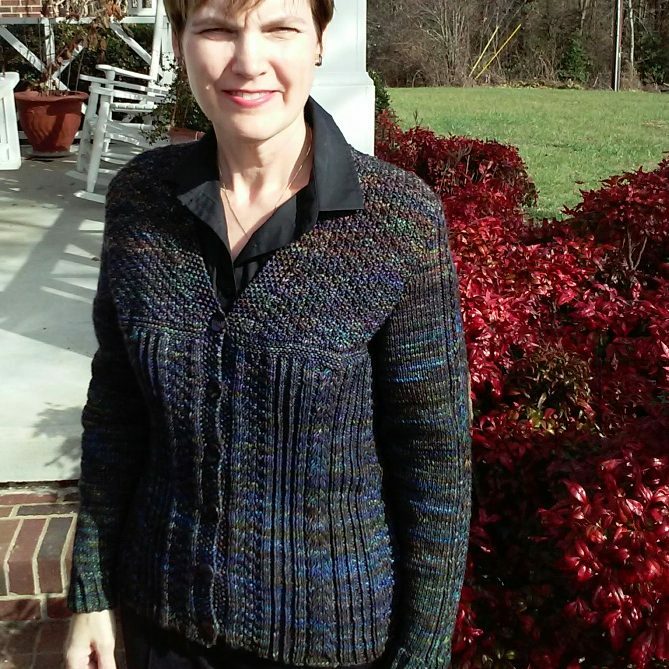 The pattern was originally Drift from Ravelry.com. I modified it to add a mock cable design and to add a design to the sleeves. It was easy to do and is very warm. I'd love to find a royal blue or purple blouse for it. 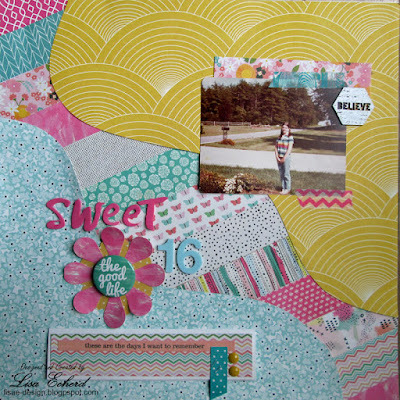 I have a scrapbook layout on my worktable and a video in progress so hopefully I'll have something new on my channel soon. Thanks for visiting today. I love my book club. A couple of years ago, DH and I simultaneously and unbeknownst to each other started looking for more social opportunities. He found a group who kayaks, something he had been wanting to take up, and I found a book club that meets monthly about 15 miles from us. My group has been around for a long time but I just hadn't gone searching for anything in many years. They are the best! And it isn't just me saying that. A few people have joined after me and some have left having moved away. We always get reports back through their friends that they have tried to find a group as good in their new town but haven't been successful. What makes my book club great? We talk about the book. It isn't gossipy. Our organizer starts and ends on time and generally keeps us on track. We don't do food or drink so there are no obligations to whip up an impressive dessert when it is your turn to host. You don't even have to ever host or lead the discussion. We all read the same book each month with a mix of fiction and non-fiction. We nominate and vote on the books to read once per year. Through our discussion, we discover a bit about each other here and there whatever people want to share but only as it relates to the book. Very few members are native to this area originally and many have moved here in recent years. They are also 'my people' politically which is a rarity in this part of the country. 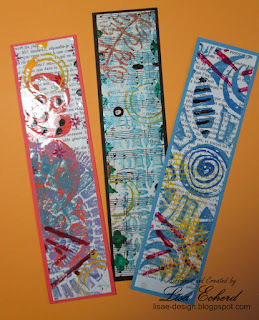 The first Christmas I was in the club I made these types of bookmarks. I placed them on the table in the center of the room and let people choose one if they wanted. I think most of our members are still reading printed books at least part of the time. Since we've had some new people join up, I thought I'd do this again this year. 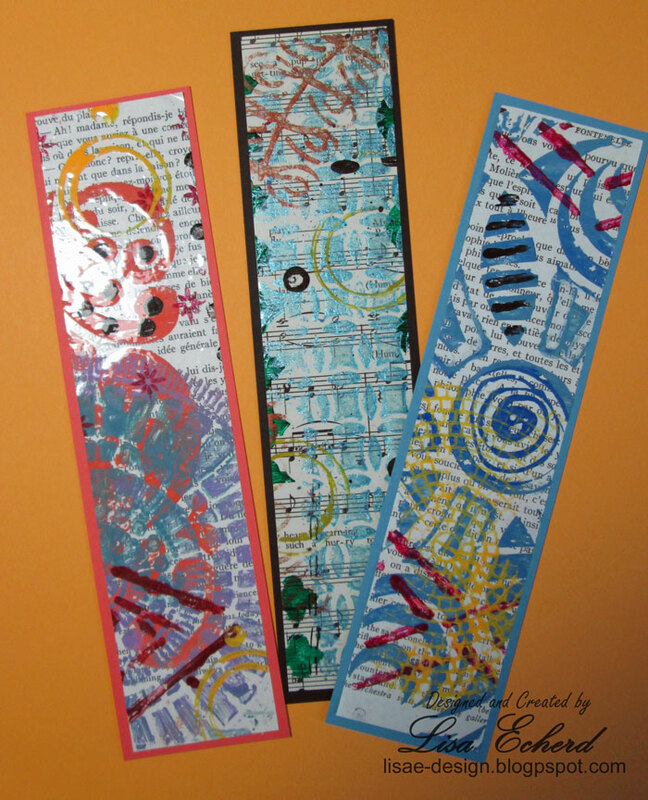 I've also made some more traditional bookmarks using stamps and and papers from October Afternoon's Public Library collection. Ironically, I just bought myself a tablet so I'm starting to read books in that format and am enjoying it. I still like the traditional bound book and many of the ones we read - both fiction and non-fiction - are found at our local libraries so my bookmarks won't sit idle. At our December meeting, the author of our latest book "With Love from the Inside", Angela Pisel, is coming to our meeting. She is local and I'm anxious to find out how she did the research for this book with one of the characters on death row and what inspired her to tell this mother/daughter story. Do you have a social club you just love? We were without power for more than 48 hours and without Internet for 8 days! Why? Tornadoes, in western NC, in October! We had no damage out our home thankfully, but 3 power poles snapped across the road and there was significant damage on my Mother's road. We spent all week at her house cleaning up. Everyone rode the storm out in basements and we are alright. This the worst damage this area has had since Hurricane Hugo in 1989. Without power, I could not do much but I did edit this video. I kept my laptop charged by taking it various places during the day and plugging it in. Finally this morning I got to upload the video which uses Distress Oxide inks on this simple Thank You card that I mass produced. It's good to be back to connecting with people online. Thanks for watching today! On this particular trip, we missed turns often. On this day, we did NOT get lost. But we did get wet! It produced some fun photos. For the two pager, I used a mixture of papers, some chipboard and some letter stickers, something I rarely remember I even have. Usually I purchase a religious themed stamp set for Mother's holiday cards. It is getting harder and harder to find one that doesn't look like something I've already had. This year in an effort to move things out and not buy more stuff, I used what I had, a Silhouette die cut and my Distress Oxide inks. Originally I was going to cut the snowflakes from silver paper but I didn't have enough and was too lazy to go to Michaels so I used gray Stampin' Up! 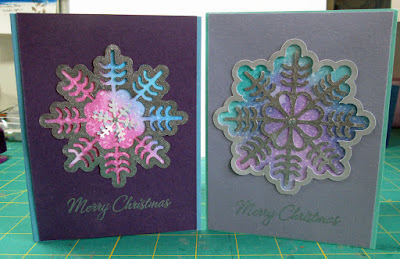 cardstock and embossing powder. It's a pretty effect. I have more bits and pieces left so I may make some more snowflakes and do some cards for myself in a similar style. Thanks for visiting today! I hope you get to do something crafty this weekend. 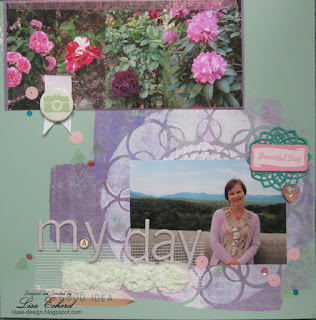 This is my first scrapbook page in several weeks. My father passed away in late August. 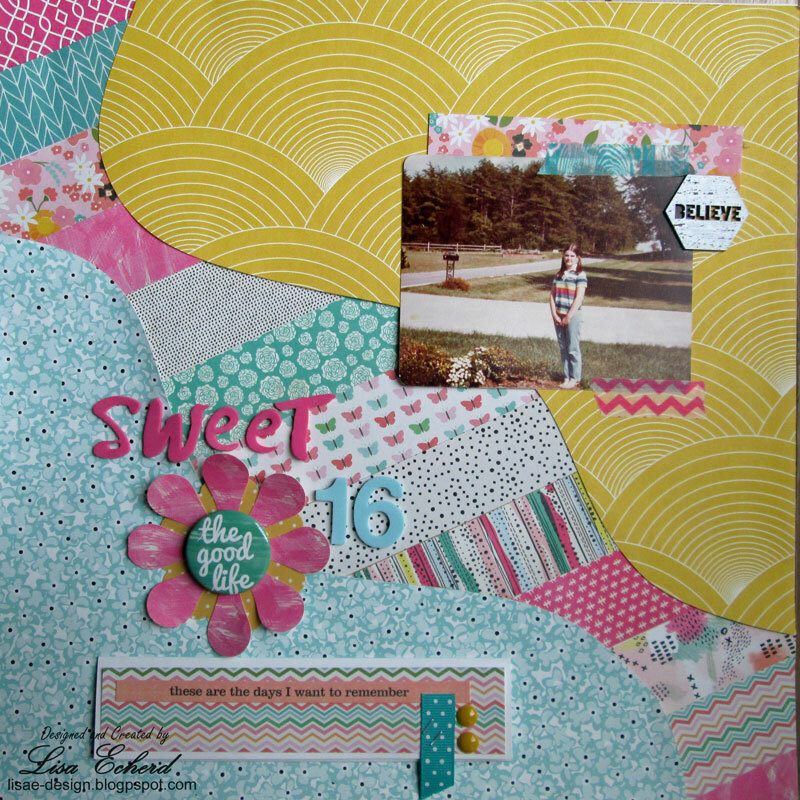 Scrapbooking is very personal to me and I busied myself with cardmaking for awhile before going back to my pages. This one is to capture what was said at the funeral, some of the memorabilia and a good photo I just hadn't gotten scrapped until now. This happened all the time. Once when Daddy was picked for jury duty, he was dismissed after they discovered he knew the prosecuting attorney, the defense attorney and the judge all because he had sold them carpet. In the early 1970’s, L was working for S & L company building windows in the ‘pink’ building. He had a part time business making picture frames. A salesman stopped and became acquainted with him persuading Daddy to just take a carpet sample and try it. He thought my father would be good at selling carpet. A few years later, he and Mother with her flawless taste went into the flooring, wallpaper and drapery business full time. Back then many houses were built on contract and if a contractor steered work your way, enough contractors could keep you in business. One Christmas he had hand mirrors cut at L Mirror and gave them out to the contractors. Now builders were all men in those days and I’m not sure how much use they had for a decorative mirror but the builders were almost all married, too. Soon he settled on apples as his annual Christmas gift, usually delivering the boxes to the contractors house himself to thank them for a year of work. Individual customers, too, often left the shop with a little something extra – a box of candy – he bought on sale of course – and kept in a chest freezer in the storeroom. They came in, paid their bill and he surprised them with a box of chocolates. And they came back again the next time. The little man with the dimples and Wedgewood blue eyes he inherited from his mother, who drove a Ford F-150 truck, and wore windbreakers, was as unlikely salesman as you would ever meet. What my father understood was that relationships built on giving a little extra would reward you and not just in business. This was part of who he was. You never did anything for him that wasn’t repaid in some way. He never ran a debt financial or otherwise. He always wanted you to know you were appreciated. He nurtured all the relationships in his life particularly with his older relatives. We spent many Sundays in Kannapolis visiting his aunts and uncles or made 4th of July trips to family around the country. Every Sunday we went to visit his mother-in-law. He liked to get to know people. We were seldom at a doctor’s office for any length of time or the ER without him asking his nurses about their shift or where they lived. When his nurse from the 2nd day of his last hospitalization returned from a weekend trip, he remembered her and asked specifically about her drive from the city she had visited. One of the last things he told me was how good the people at the hospital’s radiation oncology unit had been to him. He appreciated good care the same way he extended it to others. I imagine if he had lived, we would have been going back to the unit one day with a box of chocolates. My father seldom told me how to treat people, or solve a problem, or manage my money. He showed me. He illustrated a life of gratitude, of matching needs with resources, of saving and of responsibility. And he did those things with a smile and an interest in who you were as a person. In the end, his body gave out but his sharp mind and his heart never did. This is a lesson I've learned not in how to make a vest but in how to buy yarn. Don't succumb to the lure of beautiful yarn you don't have a plan for! I just loved this yarn but it was pricey - or pricey for me at $29 per hank. I bought two and the store owner and I thought I could get a vest out of that. Well, I did but not without a lot of challenges. 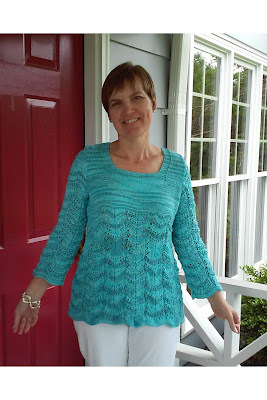 First I could not find a pattern that would work with that little yarn. Finally I found this one where I liked the look and figured I could just make it with the yarn I had. The catch was that you had to order and pay shipping on a paper pattern. It looked simple enough so I figured I could just do it myself. I decided to put the long point in a different place anyway and then I figured I'd be bored silly doing stockinette or garter stitch for the whole thing so I used a triple chevron from an old knitting pattern book. The eyelets were added again just to have something to break up the simple stitching. I never really wrote anything down, just laying my work over an old fabric vest increasing and decreasing as needed to get everything to fit. I'm kind of amazed that it did actually fit. Half way through it did look like I'd have enough yarn though it would be close. It was so close that I had this small ball of yarn left when it was time to do the arm holes. I measured it out and rolled it into two balls so I could tell how much I'd have for each one. 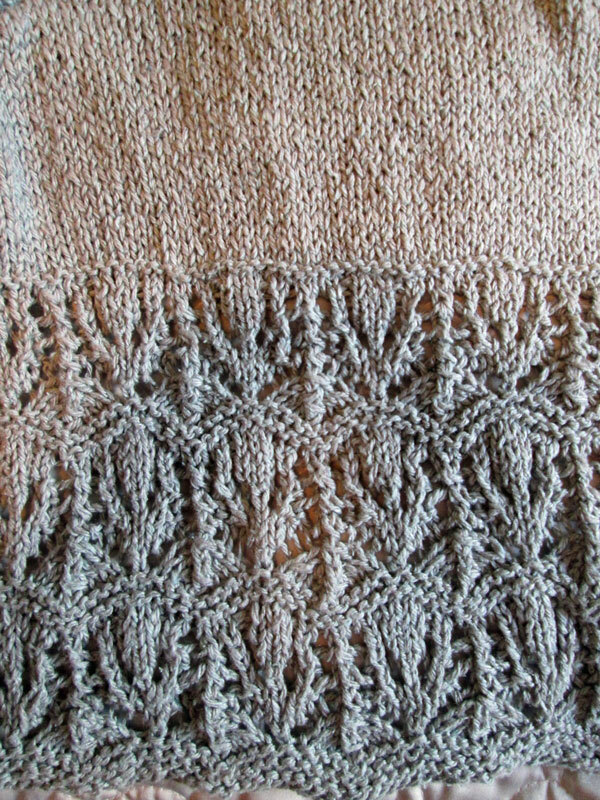 When I had a few yards of that left, I unpicked my last edge on the inside left which was a bit skimpy and added another 4 rows piecing things together as needed. 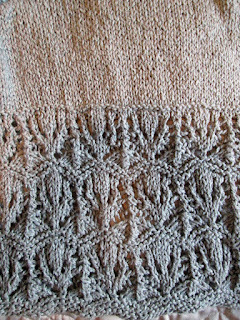 I probably had 2 yards total yarn left at the end. I was planning on one button like the pattern I'd eyed at the beginning but I put the buttonhole in completely the wrong place and I needed a bit more structure thus 3 buttons with loops for closure. 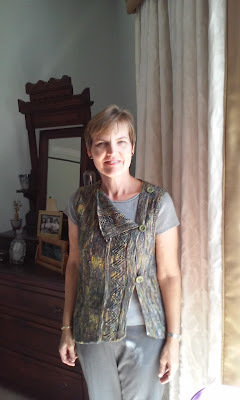 This creates many options for how to wear the vest so I've shown it in various configurations. So while I got something unique and it worked out, I'll never buy yarn again that I don't have a pattern for it or at least a very good idea that I have plenty of yarn for a specific project. 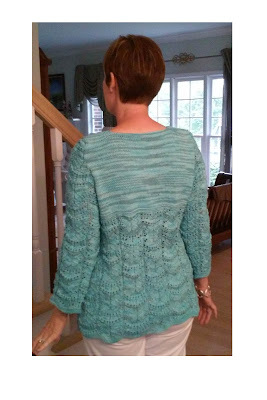 Just don't ask me for the pattern for this because I don't have it. Knitting is fun for me and relaxing and I'm also determined not to try to turn another hobby into a business. This one is just a hobby. 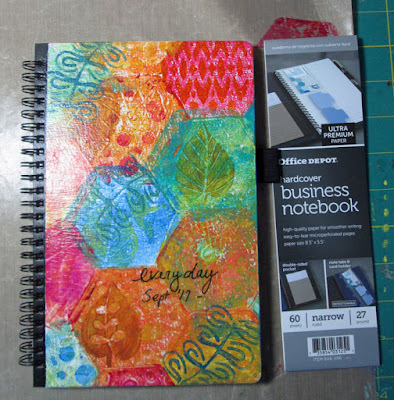 Usually I cover my notebooks with paper and have done several videos on this method. I had to change notebook brands as the one I loved was discontinued. 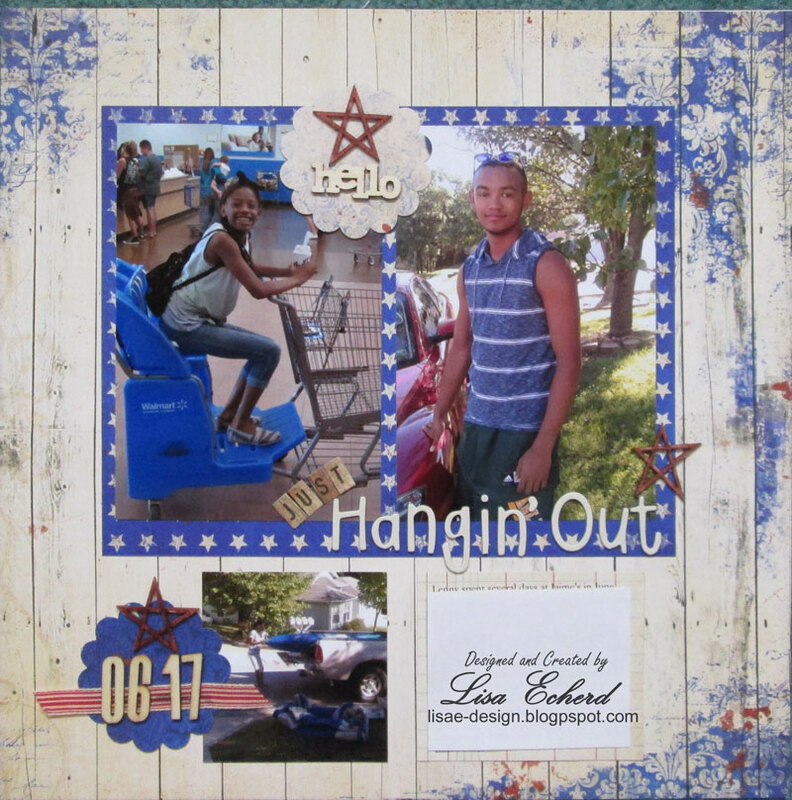 When I received my new Tim Holtz stamping platform, I stamped a few images to get familiar and then made these cards. It is super easy to use. I didn't go through all of the features as there are so many other videos online that do so. 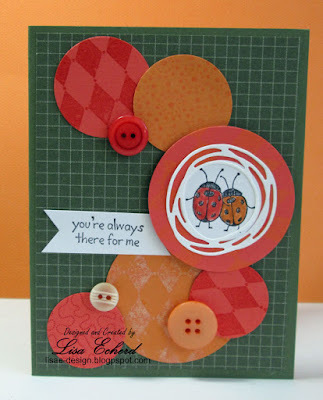 I've just focused on this card and creating a very easy and neat border. There are also videos online that compare this product to the Misti. Honestly, I never considered another product because of price. 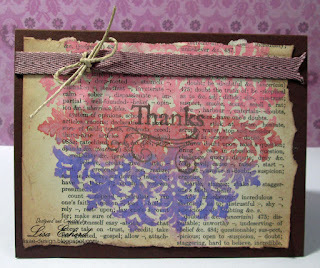 I just don't stamp enough to spend anymore than the Tim Holtz platform which I purchased through Amazon. So I can't tell you if it is the best but so far I'm very pleased. Thanks for hanging in there with me today. Hope you have a good weekend! With a noon reservation at Fallingwater, we had some time to sight see that morning. Cucumber Falls was supposed to be close to the road and looked like a good place to stretch our legs and take in one of our favorite things, a beautiful waterfall. We took one of the last parking spaces and crossed the bridge onto a well maintained trail. Soon I began to wonder why no one was coming back along the path after visiting the falls. Where were all the people who were parked in the lot? A couple of people did come along but it was 20 minutes further down to another bridge and a view and we just didn’t have the time. When we returned to the bridge, I suggested we try a small trail by the creek. It was steep and we held onto branches in places and stepped over mud but still no waterfall though we could definitely hear it. Nearly out of time, we took a selfie. After crossing the bridge back to the parking lot, Lenny said, “Wait, let’s look over here.” Sure enough there was a sign! And what is that? Steps even! The waterfall was just steps from the car. We had already been talking about how this was part of our tradition. On the first day of a trip we always walk much further than planned. We walked miles and miles to get to and from the beach the first time we went to Hilton Head. We walked more blocks than I could possibly count on the hilly streets of San Francisco until we wound our way back to the hotel. In Grand Tetons National Park, I gave up on our trek around Jenny Lake and we took a boat back to the car. In Sydney we wanted to walk the Harbor Bridge just after arriving and take the bus back. Unfortunately it was a Saturday and we didn’t have the bus schedule so we just had to walk back on only 2 or 3 hours sleep. Our long walks have given us beautiful views, slightly achy feet and fun stories from our travels. I enjoyed doing this two pager. Thanks for visiting today! 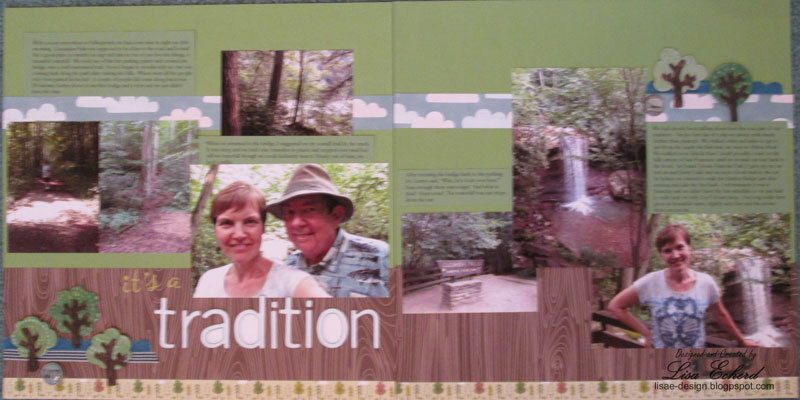 Something I find particularly challenging in scrapbooking is to scrap photos for events where you weren't there. DH visits his family each summer and often I'm not along. He spent quite a bit of time with his grandchildren but alas few photos and even fewer action shots. So I've got a couple of good pictures and no real story. Turns out they just mostly hung out doing everyday stuff so I kept the page casual and let the bright blue color lead. Thanks for watching today. Videos have been a bit sparse lately and my get even more so. Family medical needs are greater than normal right now. 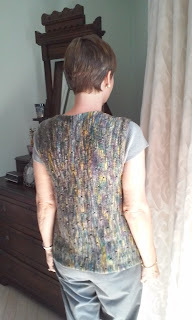 I'm also doing some sewing and knitting, just whatever helps me unwind. My sketchbooks and classes remain available and I check email every day if you have any questions. 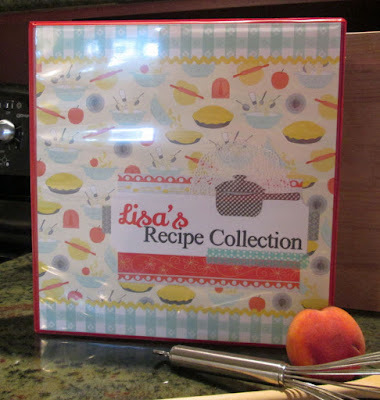 A few years ago, I noticed that a friend has organized his recipes in page protectors in a notebook all in one place. What a great idea! So I did mine and I must have had more time or motivation than I have now because I retyped them in this great format. Now I need to add more recipes and they are not getting retyped. The best I'm going to do is give them an easy to read font and size but I do to clean out my notebook. And I really needed a new notebook altogether. This one is a standard office supply store notebook. I've decorated the front with very flat items and made custom tabs so you can see them between the page protectors. I used an entire paper collection from Stampin' Up! I was happy to use it up as I've had it for years. I've had this dress for 9 years. I remember because my husband and I were going to Hawaii. A few weeks before our trip, we were all in Charlotte for my Mother's birthday in March and she wanted to visit one of her favorite boutiques. When we got there, the place was packed and there were clearance signs on all the merchandise. It didn't make sense as all the clothes appeared to be for spring. We asked and found out they were going out of business despite just getting in their spring merchandise. So we dived into the racks like everyone else. Women were trying on clothes in every possible corner, behind any type of camouflage they could find as you certainly couldn't get a dressing room. 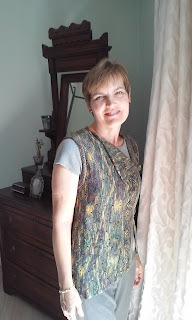 I got a long aqua sweater, a couple of printed T's and this pretty dress which I wanted to take on my trip. Despite being my favorite color, a good fit and very comfortable, I've only worn it a handful of times. It's pretty open on top with the V front and back. I've looked for a cropped sweater or shrug but never found anything that matched. A couple of months ago I went to a new-to-me knitting shop with the dress and pattern in hand. I was determined to find some yarn and make a sweater for this pretty dress. 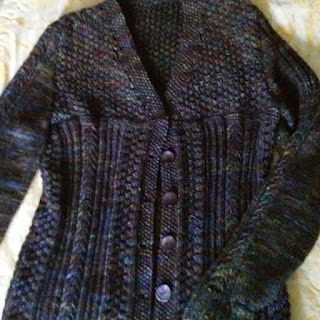 This is the finished sweater. I wish you could feel it. 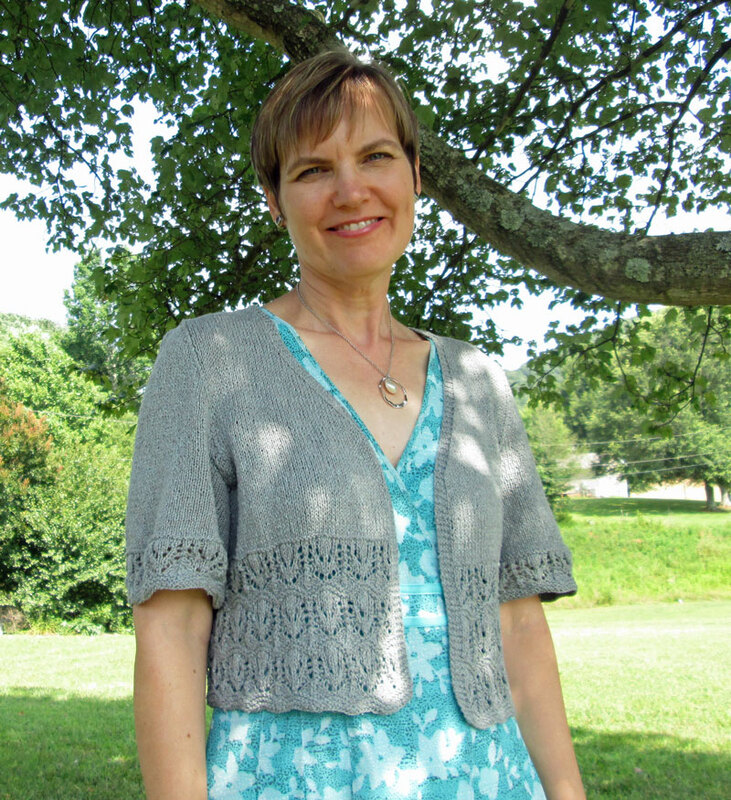 The yarn called Cozette by Knit One Crochet Too is silk and cotton and light as a feather. At only $9.50 per spool it was very economical. 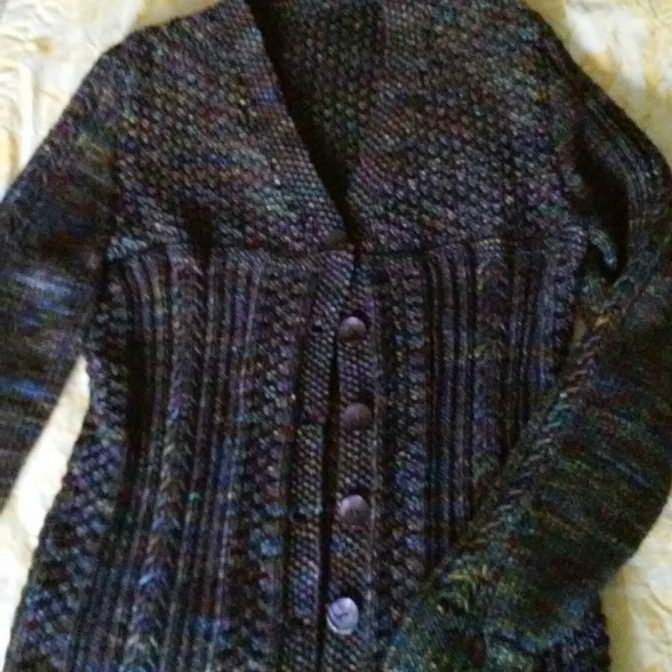 To think I hesitated taking up knitting again because I thought I lived in too warm a climate to wear anything I might make! This sweater proves that isn't true. So I still need somewhere reasonably dressy to wear this. I guess I'd better drop some hints and maybe an opportunity will appear! It won't be Hawaii for sure but maybe an evening out? 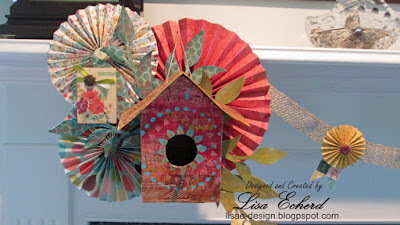 I'm working on a new papercrafting project I'll have up soon. Thanks for visiting today! A Q&A is going around for Scrapbooking YouTubers called Scrappy Tag. I was tagged by Kelly Theder Oblak to participate. There are several questions which I answered conversationally in this video. I realized when I finished that I'd focused a lot on my past window treatment business by comparison. 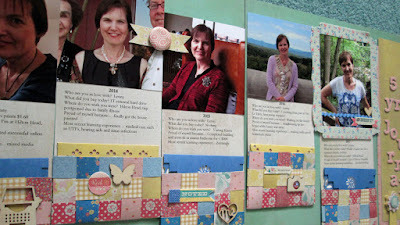 It's been on my mind lately as I just moved some sewing things into my scrap room. 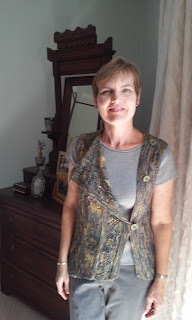 I'm not planning to go back into the business but I am getting back into sewing a bit. If you have a question just for me that I could do in another video, please post a comment here or own the YouTube video. Thanks! 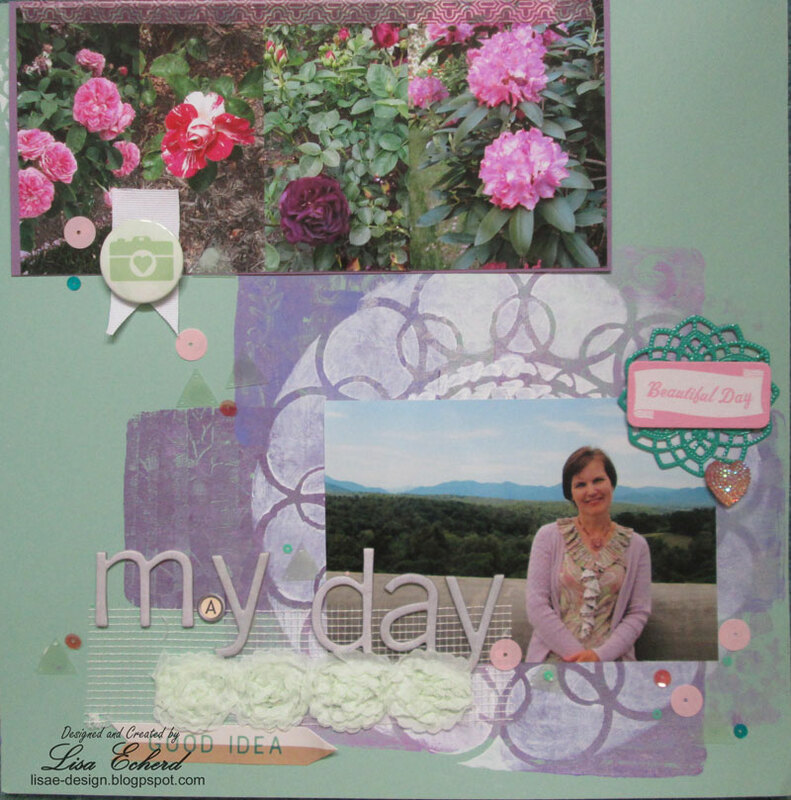 Lavender and other shades of purple are very difficult to find in scrapbooking supplies. 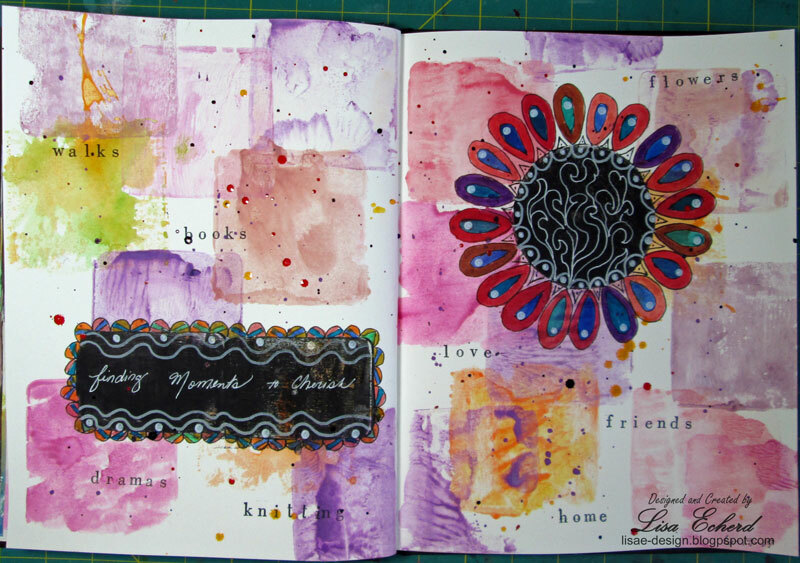 So I did my own background for this page with a gelli plate and several paints. I raided my mixed media supplies for a few embellishments. I just hit 8,000 subscribers on YouTube. Thanks for all of your support and thanks for visiting today! 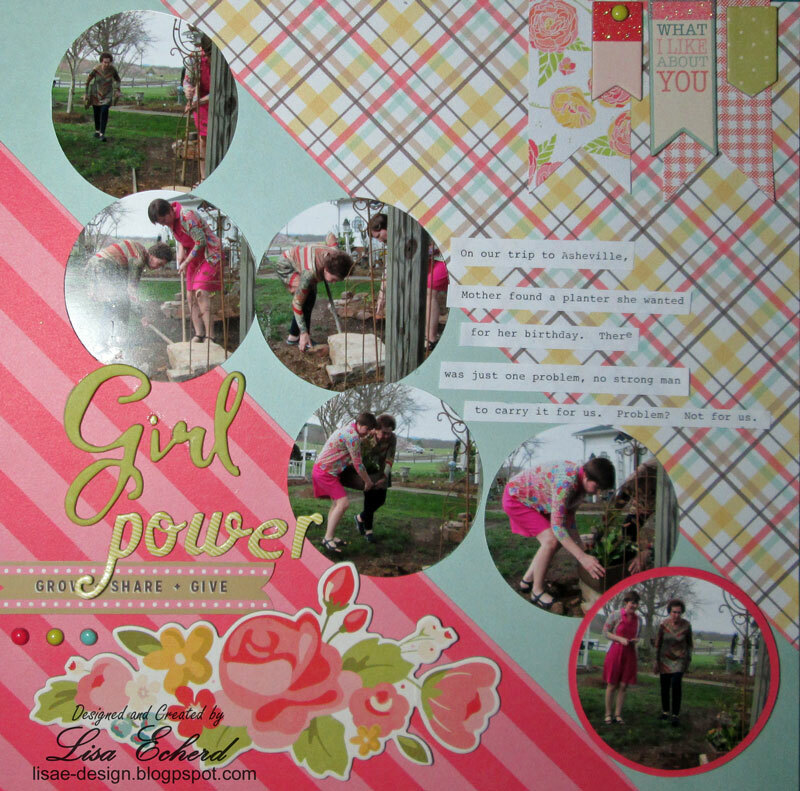 I finally cleaned up my craft room on Sunday and to celebrate, I did a little crafty play that wasn't too messy. 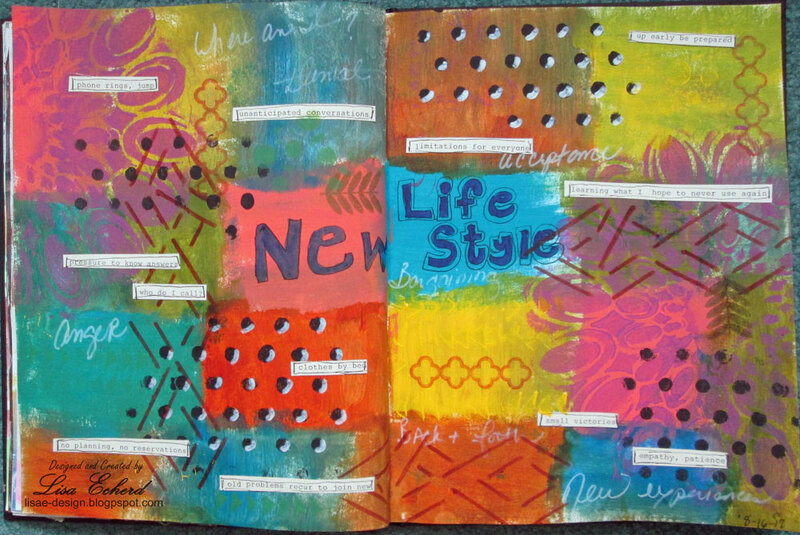 This page uses the small square gelli plate which is part of one of the packs of 3 shapes. I wanted to see what would happen if you put watercolors on the gelli plate. The answer - not much. The watercolor doesn't really spread to the edges. Next I tried using a coat of gesso on the plate and then adding the watercolor. This worked but meant a lot of cleaning brushes between layers as to not contaminate my watercolors. It was a nice experiment but I'm not sure I'm trying it again. 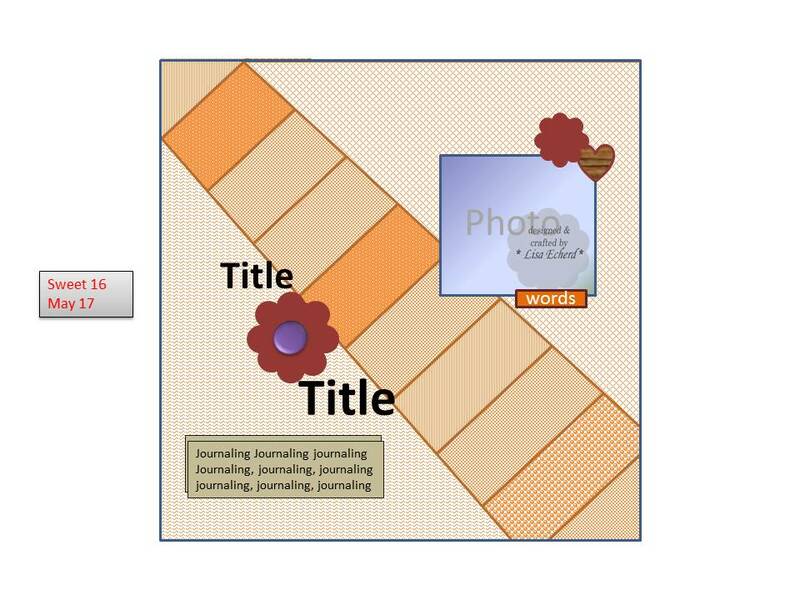 I used a round plate to make the middle of the flower and the rectangular one for the area of the tile. The rest is doodling. My doodling palette is very limited. This was not something I was really given to when I was younger and I never can figure out what to do other than scallops. 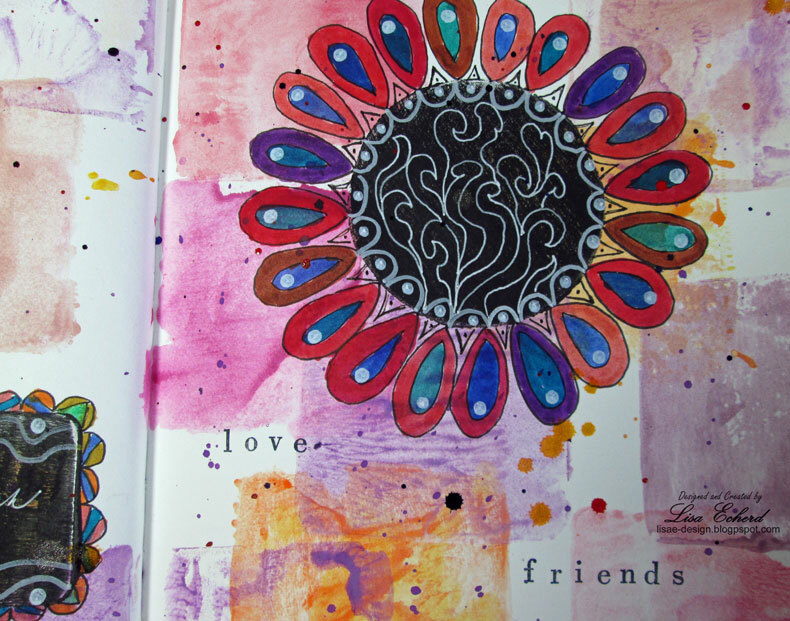 I have a Zentangle book somewhere for ideas. The white markers worked well in the black paint and the rest is colored with the Zig Big Brush markers that I love and need to find more uses for. The theme here is stolen moments between caregiving duties which have increased quite a bit lately. Having little things like a good book or my knitting helps tremendously. Watching something on Netflix takes my mind of things for a bit. And I'm grateful for friends particularly one who has been there as the only child of an elderly parent. So that's my page for today. Hope you are having a good week! A few weeks ago I got this idea for a decoration for my mantel. I started the project and did it in bits and pieces. 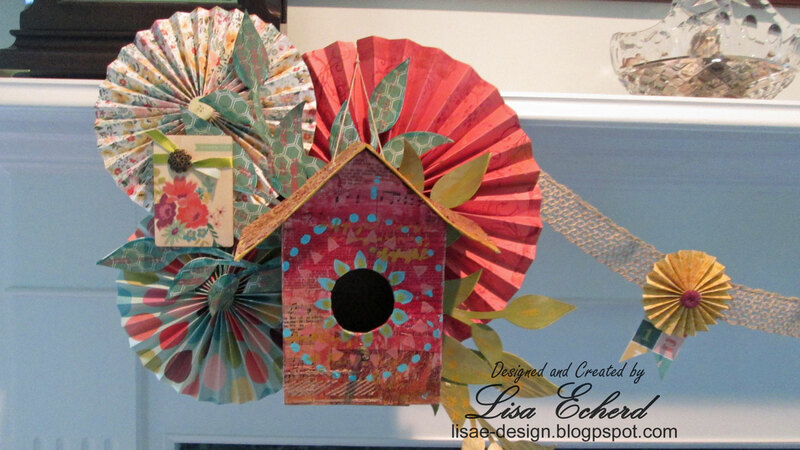 The large accordion designs went very well and I like how the birdhouse came out. This weekend I finished it but not before I almost threw the whole thing in the trash. Do you ever get so frustrated with something you just want to chuck the whole thing? My issue was connecting the pieces on the left. I knew this was going to be challenging and I thought I had it all figured out. Hot glue can do wonders but it and my attempts at engineering weren't enough. Finally I went back to an earlier idea to 'hang' the birdhouse from the top of the design sort of like it were hanging in a tree. The project is still held together with odds and ends that balance the pieces. It's been on the mantel now for 3 days and it's still there so I think we are good. We have never had a fire in our fireplace and don't have gas logs. If you create something for the mantel of a working fireplace be sure it is secured fully. I'm glad I stuck it out as I'd put a few hours in by then and it does look pretty as a little change for summer and early fall. I love birds. The Basic Grey papers and embellishments were given to me by my friend Mary and I'm enjoying them thoroughly. There are also some October Afternoon and other papers from my stash. 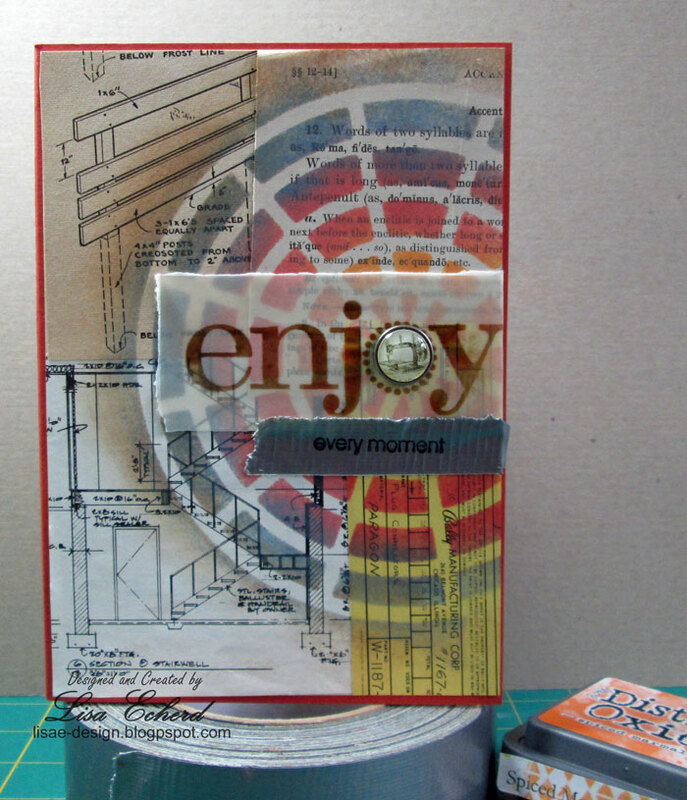 The bookpaper is available on my Etsy shop: Lovely Layers Art. My hubby's birthday is coming up and I wanted to use some bookpapers with sketches and such on them for his card. 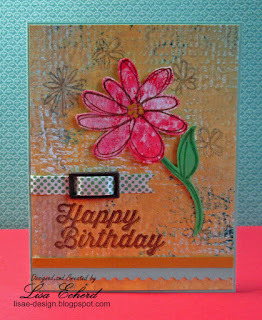 I had those pulled out and this morning's Splitcoaststampers challenge is to use duct tape on a card. For this page, I used several scallop punches from Stampin' Up! 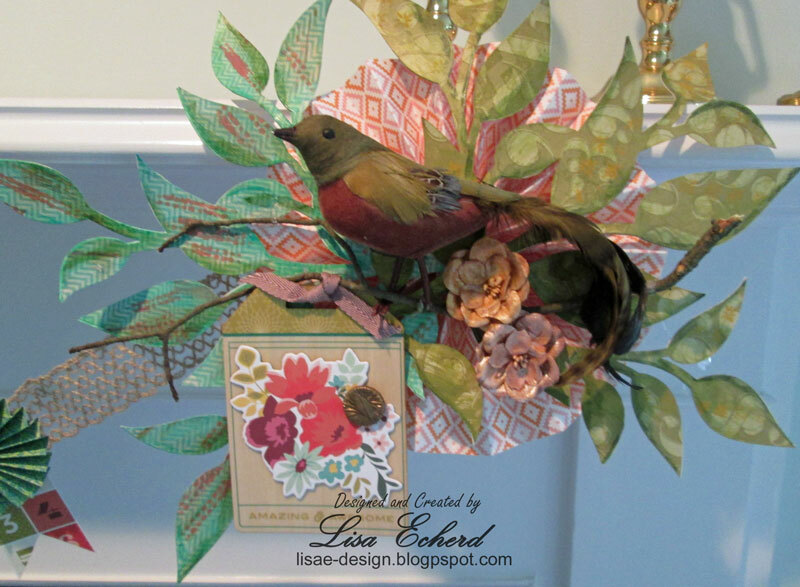 and a variety of 6x6 papers to make the floral border at the bottom. A little sewing ties things together. Vertical titles are rare for me and filled in the gap between photos. It also draws attention to my Mother's photo as you are drawn to the photo and then continue reading to the right. Let's kick off summer with a sale on ALL of my classes! 20% off through June 1, 2017. Check out all the classes on the Class page. Two videos in one day! I didn't exactly have this planned - nor anything else about this day but that is another story. 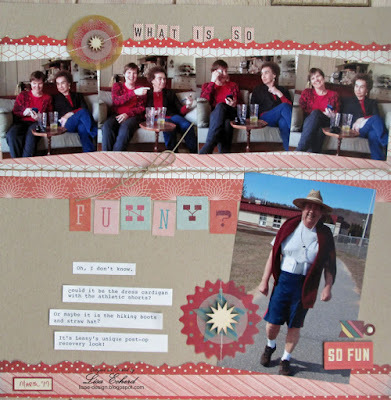 Anyway, earlier this morning I posted a video I did several days ago of a scrapbook page. 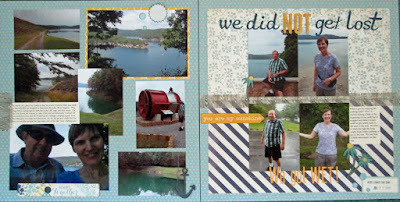 Then I decided to do the Splitcoaststampers.com color challenge. As I was pulling the product, I thought it would make a good process video. The colors are Artichoke, Coral and Peach. I didn't have the specific peach so I used the old Peach Parfait of which I have a ton of cardstock, but no ink. I used Distress Oxide ink instead. The stamp set is a hostess set and fills in the desert option to use bugs. I have lady bugs which are colored like the ones we get around here, more orange. 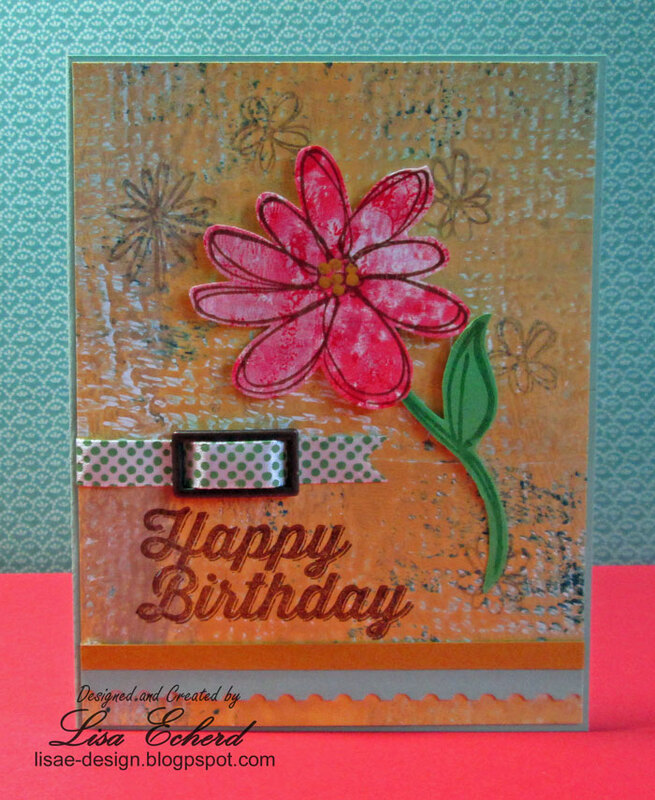 Also on the process video is a share of last week's card which was picked as the Color Challenge card of the Week! 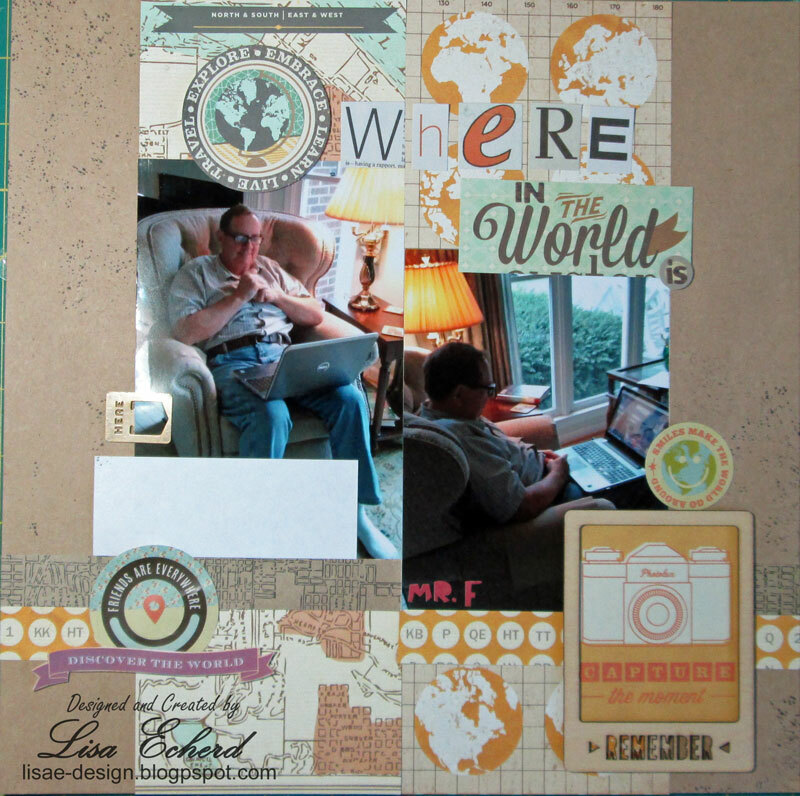 You don't have to leave home to use those travel papers. Just Skpe. Early in the morning a couple of weeks ago, my stepdaughter called for a favor. She needed someone to Skype with her class and play a 20 questions type geography game. She was planning to do this with another class somewhere else in the world but it fell through. That's what parents are for, the fall back plan. We were happy to do it though I had to hurry up and put Skype on my current laptop. I didn't realize when I agreed that I hadn't Skyped anyone since getting this computer nearly 2 1/2 years ago! DH was the person the kids had to 'find' by asking yes or no questions. They started with "Are you in the Northern Hemisphere?" and went from there looking at maps when they got things narrowed down. The question of "Do the Appalachian mountains run through your state?" sent them through several states before they got to us but they did find us. 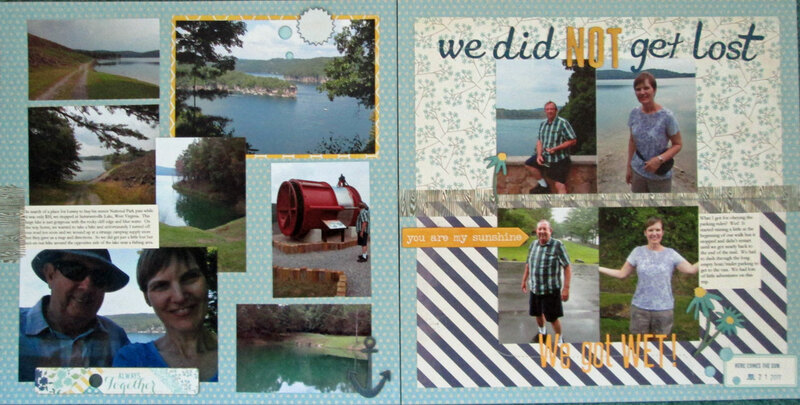 It was fun and is captured on this page using a Basic Grey travel collection generously sent to me by my friend Mary. We don't travel as much as we used to so I was thrilled to put these papers to good use. The sketch is from my first sketchbook. All the sketchbooks are available here. Hi! Hope you are having a fun NSD weekend! If you are participating in the Victoria Marie scrapbook challenges, this is the Your Happy Childhood challenge. Your entry must be posted on the Victoria Marie Facebook page on my challenge post for a chance to win the prize. Comments here, while always appreciated, do not qualify for a prize. Photos from my childhood are particularly precious to me as there are few of them. There have been other times in my life when I haven't captured a photo. If you have this challenge, check out my ebook "No Photo, No Problem." I found this photo when cleaning out my Mother's kitchen for a remodel. I believe it was at age 16 because the other photos with it show me with my first car - a 1980 Ford Pinto. I decided to take this one photo and scrap 16 things I could remember from age 16 - or thereabouts. 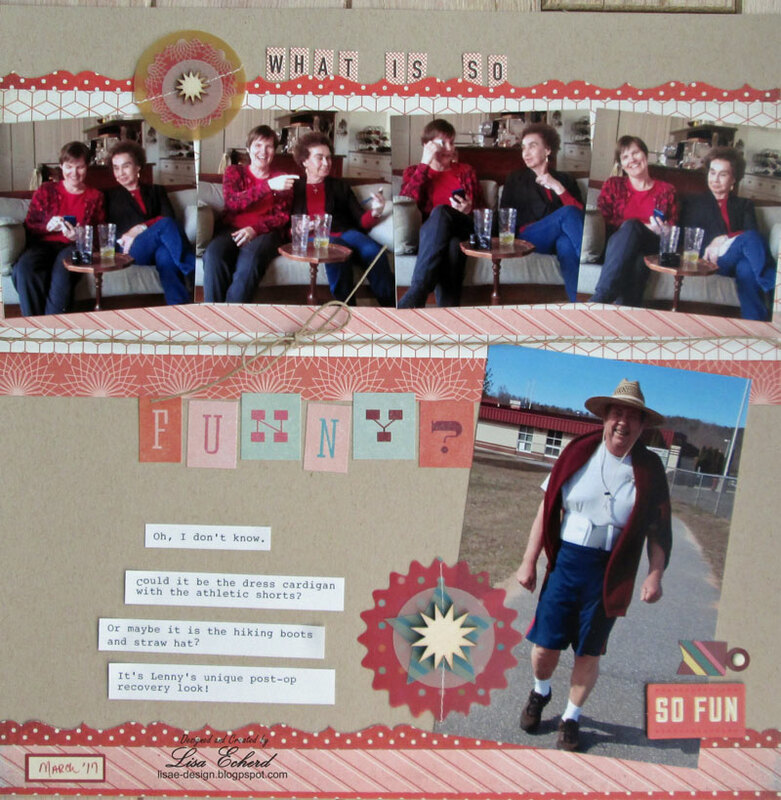 For my layout, I've used a curved cut for the background as we were just coming off the 1970's. I wanted some strips of paper to match my striped polo shirt. The 6x6 paper pads are perfect for this. I used the original of this photo. Whenever working with an old photo, I always scan the original so I'm sure to have another copy if needed. And here is the Silhouette cut file I created for the curved lines. Curved Diagonal Lines You may use it for any personal project. While you are here, I hope you will take a moment to browse the site and see the classes I have available as well. 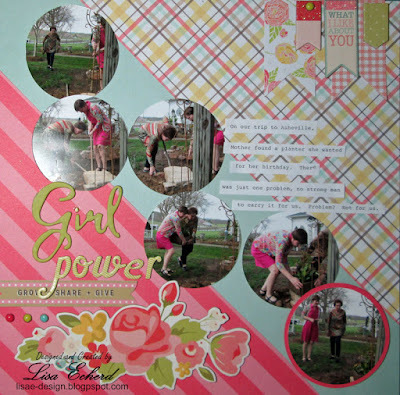 Hope you are enjoying the scrapbooking weekend! ...will. Well, not everything. It just seemed like making this page was a comedy of errors. Still it turned out fine. I think it may be my favorite new arrangement of the year. I also like that I got to use some girly product which I don't normally have a home for. Here's the process video. The format is a little different size and I don't know what caused that error either. Hope you will join me this weekend for the challenges on Victoria Marie's Facebook page. VM Facebook Join the group and take the challenges beginning at 4 pm CT on Friday. My challenge is at 1 pm CT on Sunday afternoon. It is called Your Happy Childhood and you just need a photo of yourself to scrap. The inspiration for this card came from this card on Pinterest with a vellum envelope on the front. This card had confetti inside the envelope. As I experimented, I wondered about making the inside of the envelope the main part of the card. I realized you really didn't need to open the card itself so this one is free standing with a very simple stand in the back. 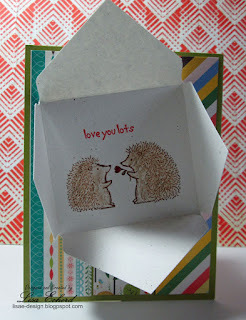 Thanks for visiting this week and if you know what color hedgehogs are supposed to be, let me know! 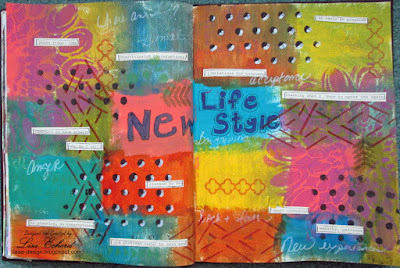 The Splitcoaststampers sketch challenge this week was yet another excuse to play with my Distress Oxide inks. 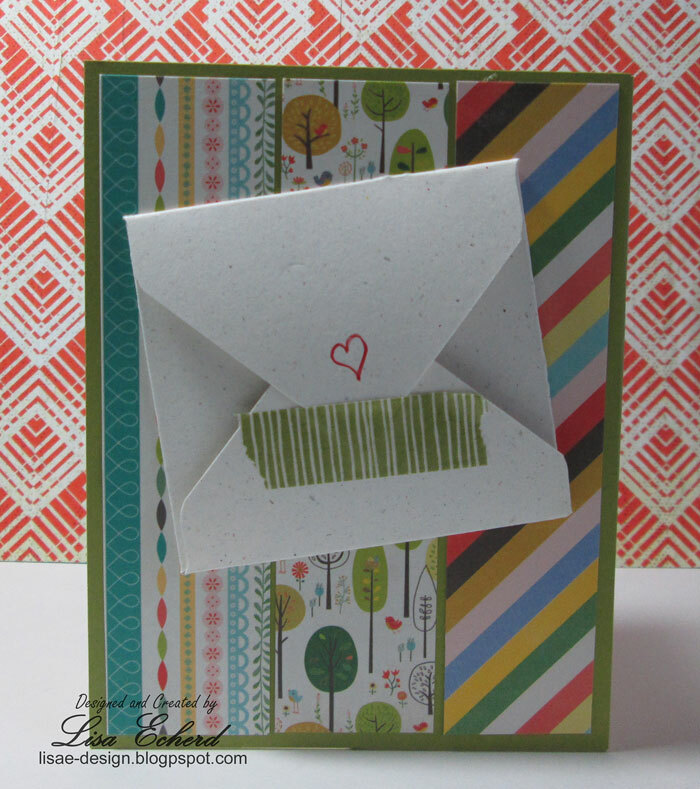 When I saw the sketch, I instantly thought of the Stampin' Up! Medallion stamp. I haven't used it in ages and that is a shame because it makes such pretty and fast cards. For this one, I inked the stamp with three of the Distress Oxide ink colors - Worn Lipstick, Fired Brick and Purple working from light to dark. 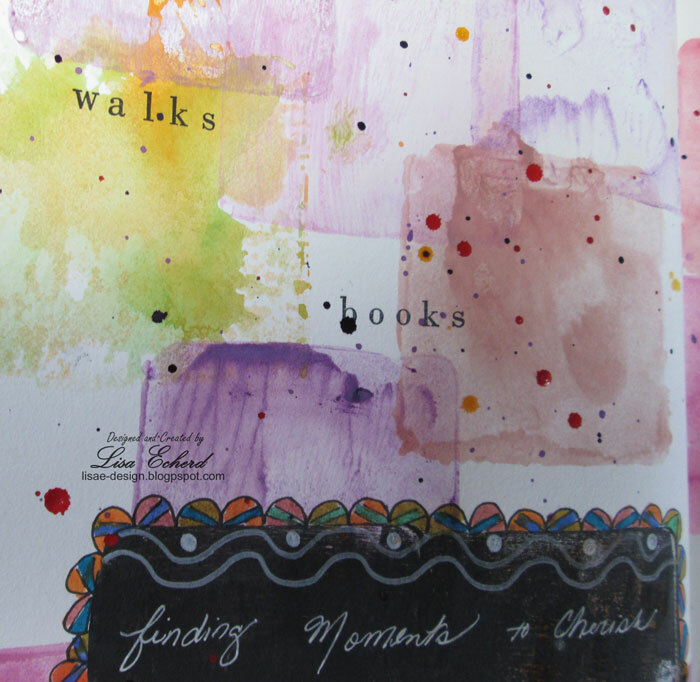 I stamped on bookpaper and then misted with water to get that oxide effect when dry. You could also mist before stamping for a pretty, softer look. 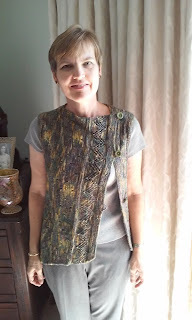 Some people like my mother have a wonderful sense of style. Others, like my husband, well, not so much. I couldn't help but take this photo of him walking in an unconventional combination of clothes. I sent it to my stepdaughter who told me I should burn it. What did I do? Scrapbook it of course! 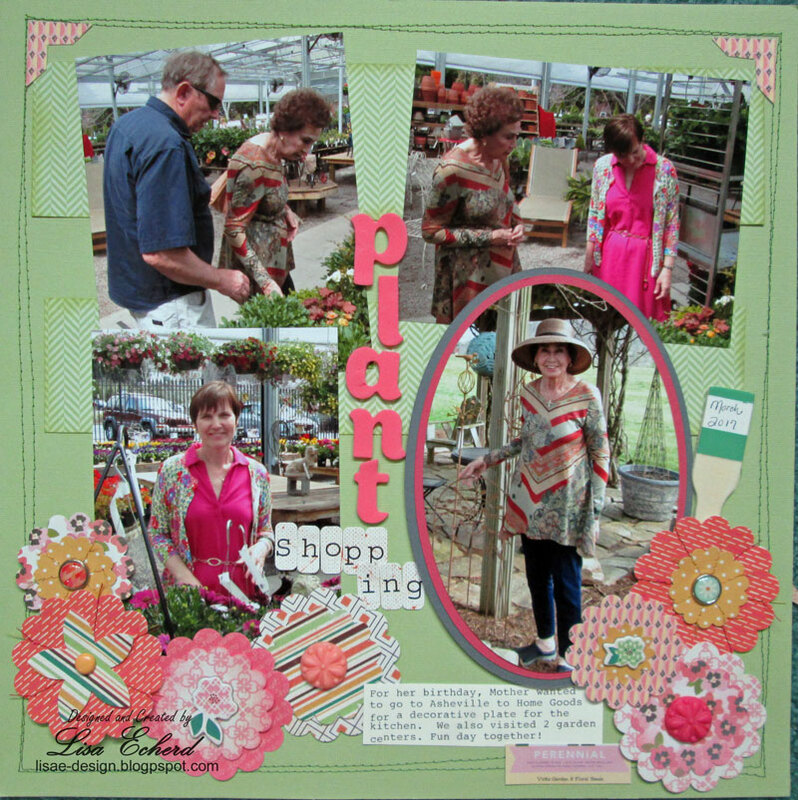 The layout uses a sketch from the 2016 Sketchbook that was originally meant for more photos. The 4 I have fit nicely along the strip at the top with a larger photo on the bottom. I'm continuing with the same Basic Grey collection I used for the last layout. Hope you are having a wonderful day. Thanks for stopping by! 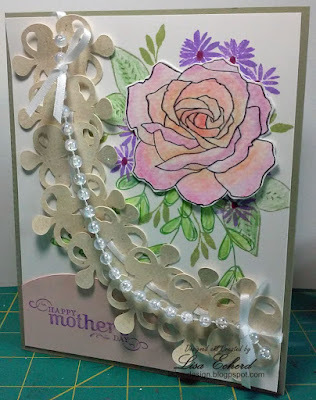 I took the inspiration challenge at Splitcoaststampers today and took the opportunity to get my Mother's Day card done. Last night my BFF mentioned using the 5th Avenue Floral set. It was still on my mind as I looked through the gorgeous Pinterest gallery linked up to this challenge. All the challenge details are shown here. I chose a photo of an arrangement with peach/magenta roses and little purple flowers. I was also inspired by a photo of a ballerina's costume that included detailed lace and satin cutouts. To create mine, I cropped down a Silhouette border and then cut several individual pieces so I could curve them into the desired shape. 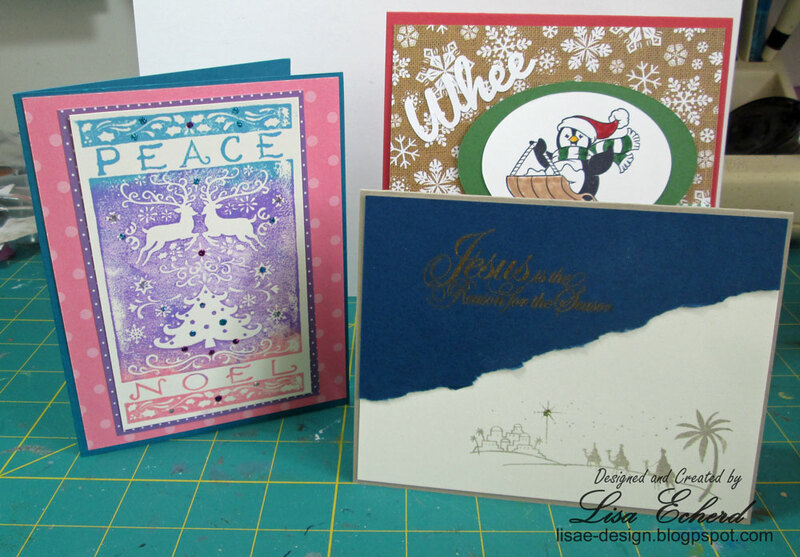 They are coated with some iridescent ice embossing powder and linked with narrow white ribbon and a strand of beads. The sparkley doesn't show up that well in the photos. 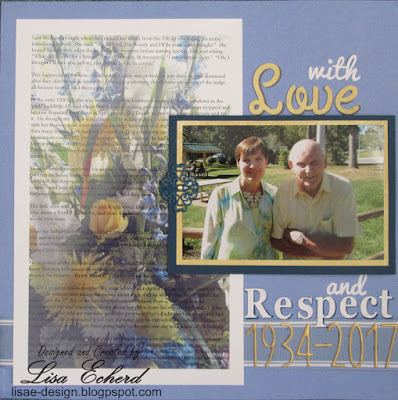 I combined several stamp sets to get the floral arrangement. The rose is colored with watercolor crayons and the leaves are colored with colored pencils. 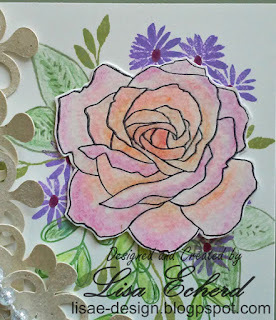 The purple flowers are stamped with Distress Oxide ink. 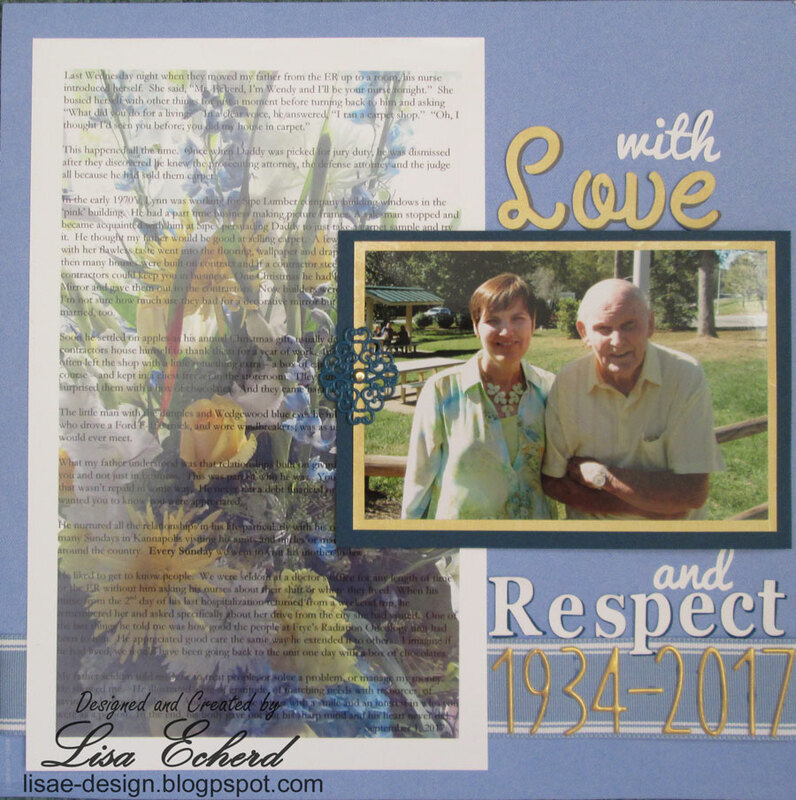 It was a joy to just experiment and play making a card. Thanks for visiting!